Classic wartime sitcom featuring the Home Guard of Walmington-on-Sea. Mainwaring and Wilson are in the bank when an unexpected guest drops in. Browse content similar to Something Nasty in the Vault. Check below for episodes and series from the same categories and more! -Oh, good morning, Mr Jones. -How's Mr Mainwaring this morning? -A bit tired, I think. Are these night patrols getting him down? They're getting my mum down! She's fed up with me and Uncle Arthur coming in at all hours. None of us are getting enough sleep these days. With the war on, we all have to get used to going a bit short. That's what Uncle Arthur told my mum, Mr Jones. Is this your wages cheque for the week? and 22/6 for the boy, Raymond. -He used to get a pound, but I've given him a rise this week. If you want good staff, you've got to pay them properly. Yes. There's two £1 notes, a ten shilling note and a half crown. I'll put it in the carrier bag. If people hear I'm carrying wages, I might get knocked on the head! Hello, Jonesie! Drawing out the wages? Morning, Mr Walker. Paying in again? That's three times this week. I can't keep it all under the mattress - it gets so lumpy. -There's something funny about this £5 note. -You mean it's a dud? -I'd better show it to Mr Mainwaring. Tell you what, I'll look after the shop, see nobody nicks nothing. Are you paying in or taking out? 'Ere, d'ya want any clothing coupons? -I'll do a special price. Ten bob a dozen? -I haven't got a car. Look here, Walker, this £5 note is a forgery! What's all this Walker bit? I'm not on parade now. I'm a customer! The point is, I cannot accept this note, Mr Walker. You mean it's a fake? And a very obvious one! Only a fool would be taken in by it. Who gave you it? Last week. Don't you remember? I got you three bottles of whisky. All right, I'll give you five ones. You ought to take more care of your money, Mr Mainwaring. -Can you get me some razor blades? -They're scarce, but ten bob a dozen. I told you, they're scarce. Give me the money and I'll bring them tonight. -No, I haven't got ten bob. Wait a minute. I'll take it out of YOUR money. Just a moment, Pike. There you are. That's one for you, and one for me. You're a financial wizard, Mr Mainwaring. See you on parade, MISTER Walker. I'll be there, Mr Mainwaring. Don't take any more dud fivers. -May I have a word? Yes, Mr West. Did you wish to open an account? No, I did not. I'm an inspector from the Head Branch. -Perhaps we'd better go into my office. -Yes, perhaps we better had. Oi, what's old Mainwaring been up to, having a bank inspector here? Let me take your hat and gas-mask. -Thank you. Do sit down. Do you always interview people with a revolver on your desk? Oh, yes. Especially in the spring. What's the spring got to do with it? Surely you realise Hitler is only waiting for the spring to invade? And I suppose you think you'll stop him with that popgun? Not only me. There's the rest of my platoon. We're fully armed and trained to kill. Really? Well, I shall come to the point at once, Mr Mainwaring. Your monthly report to Head Office has become very irregular lately. from Stone's Amusement Arcade to the Novelty Rock Emporium? Some of you chaps will be heartbroken when this war's over. You just love the Home Guard, don't you? Gives you every opportunity to dress up and strut about in uniform! For your information, Mr West, I never strut! What's that damn great gun doing there? It's a Lewis machine gun, Mark 1.
as it covers the street from Stead and Simpson's to Timothy White's. You'd use that to shoot at Germans!? If they were coming out of Timothy White's, yes. But they'd damage the bank! Don't you realise that?! This is highly irregular! I must report this to Head Office. -This is Sergeant Wilson, my Chief Clerk. -And Private Pike, one of my cashiers. -What day is it, Pike? -What plan do we put into operation on Thursday? Please, sir, can I put Plan B into operation? You promised me I could! Ah, that's what I like. Keenness. -No, sir. Not at all. Attention all staff! Plan B will be put into operation! Non-combatant staff to Shelter A ! 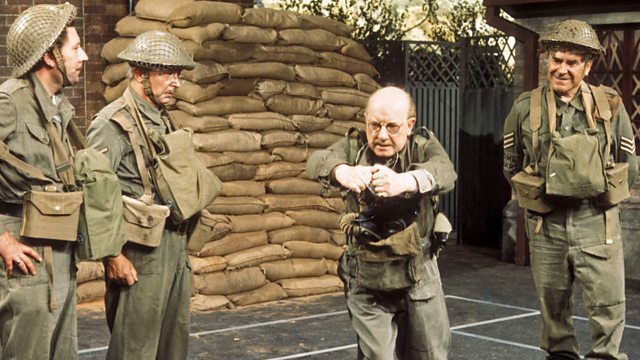 Captain Mainwaring, Sergeant Wilson and Private Pike to Shelter B. -Potential NCO material there, I think, Wilson. That's how it works here, sir. Like a smooth, well-oiled machine. -There's one thing you've forgotten. Today happens to be Friday! You stupid boy! Stop them at once! Really, Mainwaring! What a complete waste of time! Two hours we've been in that shelter, doing nothing. All we heard was one plane, and it might have been one of ours! Oh, no, sir. It was a Dornier. You could tell by the noise the engine made. -They do have a high-pitched whine. They go...nnn-nnn-nnn-nnn! Ours have a slower and steadier sound, like, mmmmmm-mmmmmm! You can always tell a Jerry plane. It has a nasty, foreign sound. This is no time for a lecture on enemy aircraft! -Get on with your work, Pike. -Just go, Frank. Leave the room. You realise I shall... Good heavens above! -I've never noticed that before, have you? While you've been playing soldiers, someone's broken into the bank! Get on to the police! I can assure you, all the money's in the strongroom. Then what is that? And that? -Where the devil's he gone to? -I've no idea. Mr Main...! Oh, this is absurd! What are they playing at? Eee! Someone's broken into the strongroom! I say, somebody's broken through the floor into the strongroom! Mainwaring! Can you hear me? Are you there? All right, sir! Keep it steady! Keep it up, sir! -I'm trying to get hold... It's very heavy, sir! -Let it go - easy, easy! Don't jog your end. What are you doing down there? Mainwaring! Mainwaring! -Any movement could set this off! -We can't sit here all day holding it! we'll be sitting on a cloud, holding a harp! Mainwaring! Why don't you answer me? Have they taken much? What are you sitting there for? What's that thing on your knees? It fell out of the plane. The one you said was one of ours. Don't you realise that's a bomb? It might go off at any moment! What would Head Office think? Stay there! Don't go away! I'll get help! Don't move, whatever you do! I'll get help! Blimey! That was Shell, that was! I've brought your sausages, Mr Mainwaring. -Yes, I brought your sausages. Where are you? Oh, I get it. You're doing a camouflage. That's very good. I can't see you at all. -Oh, I give up. You're too good for me. Give us a clue. Am I getting warmer? Warmer? You shouldn't have gone to all that trouble to hide from me, sir. I've brought you some sausages. I know you like a nice banger. Blimey! Is that a bomb you and Mr Wilson are holding? Of course it is! Go and get some help! Yes, I will, sir. I will. Don't panic! Don't panic! Don't panic! You're all right! I'm in charge now! I'm in charge! Don't pa...! Private Pike, come in here! At the double! You hold on, Mr Mainwaring and Mr Wilson. Hold on. -I'm not panicking. What's the matter? I'm putting this bank under martial law! -There's an unexploded bomb down there, Frank! -Then hadn't we better get out? -It's OK. It won't go off - Mr Mainwaring and Mr Wilson are holding it. then I'll go to my shop and phone the bomb disposal people. And they will do that. Then I'll find the people of my platoon and come back here. Yes. -Er...put your tin hat on! Get a gas-mask and a bayonet and don't let anyone in except me! -What do I do if the bomb goes off? Mr Mainwaring? Uncle Arthur? Are you down there? Is that the bomb you're holding? Pike, what's going on up there? Mr Jones is in charge. You have nothing to worry about. We've everything to worry about. Has he sent for the bomb disposal people? -He's just phoning them now. -Do you think I out to phone Mum to tell her? She'll be angry if she finds out and you didn't tell her! -Pike, are the staff out of the bank? -Mr Jones is doing it, sir. Make sure he is. Get everybody out of the bank. Righto, sir. What plan, sir? A, B, C, D or E? -Who are you shouting at, lad? -The staff. We're using Plan B. What are you talking about? There's nobody there! Some wild-eyed lunatic said there was an unexploded bomb in the bank. Is that right? Get back! Go on, get back! This bank is under martial law! No-one gets in unless Mr Jones says! Put that down, I'm trying to help! No! I've got my orders, and no-one will stop me carrying them out! Is that a bomb you're holding, Mr Mainwaring? If anybody else asks me that, I shall go mad! Don't you realise that bomb could blow up half the high street? This is an ARP matter! I'm taking charge of the situation. Don't do anything silly. I'll be back in a minute. Well, now that you've brought it up, yes, I am a bit. itching on the end of my nose. -Oh. You hold it steady with both hands and I'll wiggle my left hand out. I think I can probably... scratch your nose. That's awfully good of you, sir. -No, no, no. That's...just right. How long since you phoned the bomb disposal people? About 20 minutes. They said they'd be as quick as they could. I hope to God they are. I've got your razor blades, Mr Mainwaring! That's a stupid remark, that is! He won't want to shave at a time like this! I'm trying to comfort him. In times of stress, you need to talk about normal things. Yes. We ought to try and keep things as normal as possible. -Listen. Get your men out of the bank. There's no point in risking your lives unnecessarily. I think he's right, you know. There's nothing we can do, even if we stay. I see, it's like that, is it? Anyone else want to go? Hang on. I didn't say I wanted to go, I just don't see what we can do. -I don't care about that. I'm staying. -What about you, Mr Godfrey? I'd rather stay. It must be a comfort to them to know we're here. After all, Mr Mainwaring wouldn't leave us. I can't leave my Uncle Arthur. My mum wouldn't like it. Right. Joe, if you want to go, go. Oi! What do you blokes think you're doing here? Nobody's allowed in here. I've cleared the street. You're not clearing us out - I'M in charge! This is an ARP matter! I'M in charge! That don't cut it with me, mate - I'm in command here. Captain Rogers, bomb disposal. I'M in command. Oh, yes, sir. Right, sir. -Are you chaps all right? We'll soon get you out of that mess...I expect. Tell me, who keeps the key to the strongroom door? We do, but they're both on us. Can't you get through the hole? I wouldn't like to chance it with my weight. It might set that damn thing off. It's a bit tricky, that. Rather tricky. They've got the only two keys down there. -Jonesie, I'm going to kill you! Let me go down that hole, sir. I'd like to go down that hole. No, sir. I'm much more wiry than he is, sir! I wouldn't want to chance anyone going down there. The bomb is balancing on a piece of wreckage. and the whole shebang will go sky-high! Yes...well, I'll go and see if the street's clear. Leave it to me! Hold on a wee while longer. I think I've got something in the shop that'll do the trick! Hey, I've got a bite! Whatever you do, don't pull it now! All right. Take it up. Slowly. Very gently. All right, Captain Rogers will be down in a minute. -How are we today? All right? I'll just make sure. I think it is. We want to know what we're tampering with, eh? -It would be as well. and makes a crater six metres in diameter, three metres in depth. I thought they'd stopped using these small bombs. -Is this a small one? They're using 100kg ones now. But I have a pet theory about these bombs, you know. I think there's a dead area. If you're in the right position, you'll only get slight concussion. -I haven't put it to the test. I wouldn't like to, would you? I can't hear a damn thing! Your heartbeats are vibrating against the casing. -That's fine. Nothing to worry about. -Can we let it out now? Now, then, I think we can penetrate. I'm afraid we've got a trembler. -Is that a bad thing? -I'll have to go and get a special tool to deal with that. I'll have to nip back to HQ. I'll put that on to steady it. Whatever you do, don't tip it at all. Otherwise... Well, just keep it level. I'll get back as fast as I can. I'll just close this door. We don't want anybody to pinch anything, eh? You know, sir, I don't think I can stand very much more of this. Oh, come on, Wilson. Cheer up. "There is a destiny that shapes our ends, rough hew them as we will." of the Australian soldier sent to the front. He was met by a British officer who said, "Did you come to die?" And he said, "No, sir, I came yesterdie!" It's a play on the words, you see. -On the pronunciation of the word "die". Yes, I do get it. Yes. Just a wee while longer. You'll be out in no time. It's all right, sir. We've got everything organised up her. Excuse me. I wonder if you'd care for a cup of coffee? -Thank you, Godfrey. It'll be most welcome. We're nearly ready now, Mr Mainwaring. -What's going on up there, Corporal? JONES: When I give you the signal, you lower this away, right? -Oh! Wait a minute! Oh! Take it up! Take it up! -Are you all right, Jonesie? -Now you'll be all right, sir. -What on earth are you doing, Jones? We're going to lift this bomb off you. -Shouldn't you wait for Capt Rogers? -No, he'll be ages. No time to lose. -Here's your coffee, Mr Mainwaring. That's the wrong one, Godfrey! Oh, dear! Then the other one's wrong, too! -Could you put your finger there? Walker! Put that money down at once! -Sorry, sir. I suddenly felt that I'd like to die rich. Godfrey! What kind of knot do you call that? It's one we used at the Civil Service for Christmas presents. I think it's called the Cupid's Bow. It's a good job I didn't have you with me in the Navy! I don't know. I've always fancied the idea of being a sailor. That should do the trick, Jonesie! You lot go upstairs and get ready to haul. I'll stay down here and keep the bomb steady. Don't worry about the coffee cups. I'll wash them up later. -Now, Mr Wilson, you know what we're going to do? and we've pulled it up a little way, we'll tie it off. -That's all right, my dear. -You all right, Mr Mainwaring? -I think you'll get mentioned in dispatches for this! When it's all over, I'll give you half a pound of liver. -Are you lot ready up there? -Well, you take the strain. -Take the strain! Away you go! Wait a minute! Wait a minute! No! every member of our platoon is part of a close-knit unit. It's safe to say every man today played his part to the full. On behalf of Head Office, I think I can say we're proud of you all for saving the bank. Sir, that was eleven pints and Mr Godfrey's port and lemon. All of that came to 10/6. Mainwaring, I think Head Office would like to show their gratitude. -Take it out of that. -That's very civil of you. Where's my Arthur? Arthur, there you are! Are you all right? Mavis! Please...! No need to fuss. -No need to get hysterical like this. You're so brave, you really are! And you, Mr Mainwaring! Excuse me, sir. She won't take it. -That's very generous of her. -No, she says it's a dud. Don't worry about it. Here, take it out of this. Walker! That money belongs to the bank! Does it? I thought it was bomb damaged!